When I found my daughter-in-law and my daughter were pregnant, one of the first things I did was to go to Live Laugh Louise and buy these little booties. Jayne from Nana’s Hands makes them. 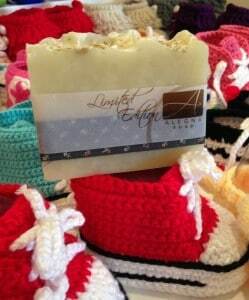 I thought they’d also make a great backdrop for Alegna Soap® Herbal Mint Limited Edition soap. You need to go to see the entire collection of crocheted shoes. Too cute!